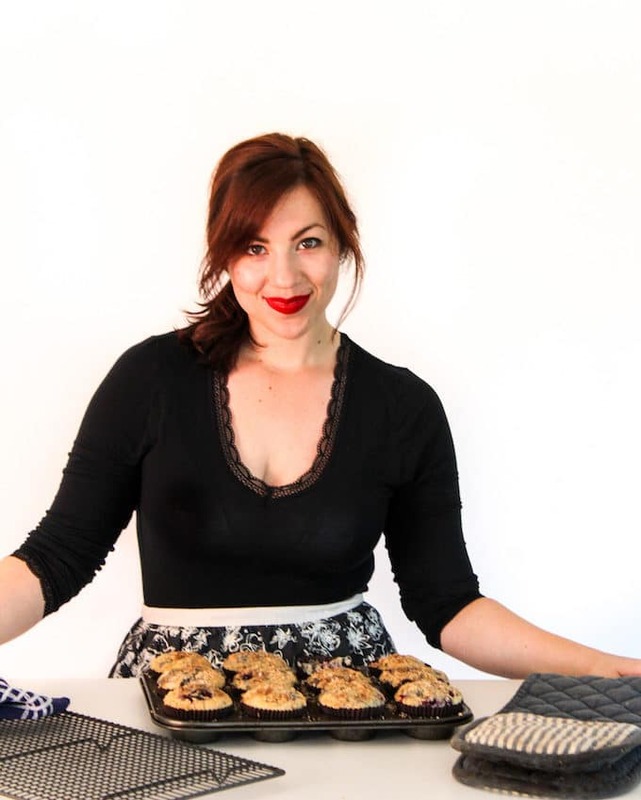 The best part of every fruit crumble is the actual crumble part. Don’t get me wrong. I love fruit fillings. But let’s be real. It’s all about the crumble. Which is exactly why the raspberry crumble bars are where it’s at. Double the crumble. Double the love. Sorry for repeating the word ‘crumble’ so much! Last Friday Mike and I made our way to a local Pick-Your-Own farm. It’s so local that we actual didn’t even need to exit the neighborhood to get to. And yet somehow in the two years that I’ve lived here, I didn’t even know this place existed. How’s that for oblivious? In my defense it’s not close enough to walk to easily – not with all the monster hills and whatnot. Now that the summer is here in all its sun shining glory, Mike & I are trying to take advantage of as much blue sky as we can fit in. 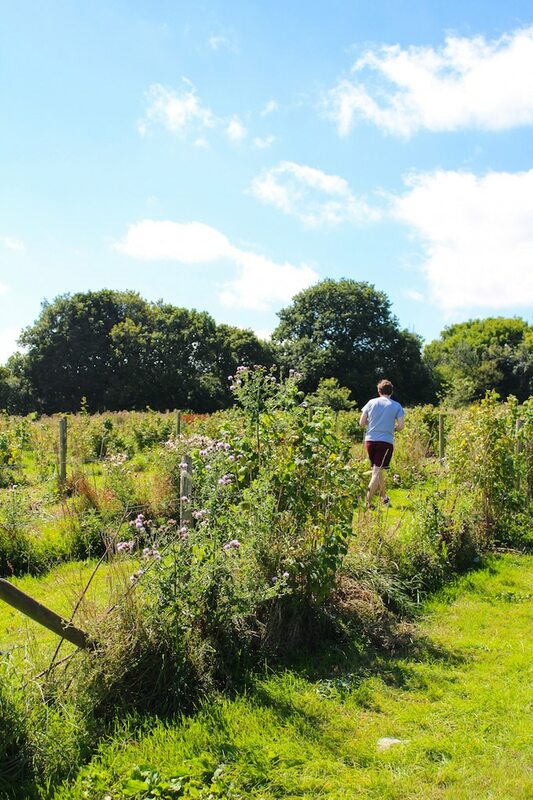 Sheffield’s filled with so many different hikes and walking routes, it’s been fun going out and exploring parts of the city I’d never seen before – including this Pick-Your-Own farm we found. Unfortunately for us most of the summer best was already picked over by people far more informed than we are. All that was left were the raspberries and there weren’t much of those left over either. 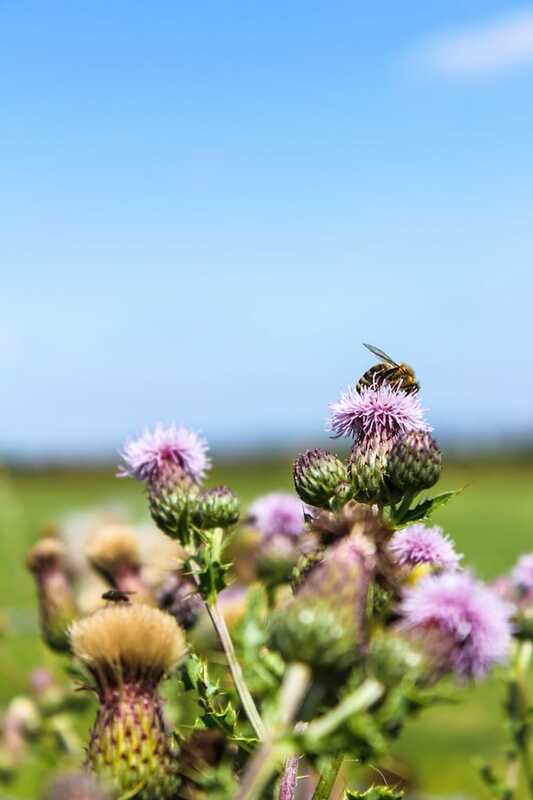 Personally though I think it ended up being more fun to stalk up and down the rows of plants trying to keep an eye out for the bright red berries. Making some sort of crumble out of our little bucket full of berries seemed like a no brainer after we got home. I’ve always been such a sucker for fruit crumbles because I just can’t resist sneaking off little bits of oat sugary crumbs. With that in mind, raspberry crumble bars felt like the most obvious choice. This particular recipe is based off of the strawberry rhubarb bars I made last year with just a few tweaks to the filling and the crust. You can makes these with butter or oil depending on your preference. If you do make it with coconut oil you’ll end up with a slight coconut-y taste. 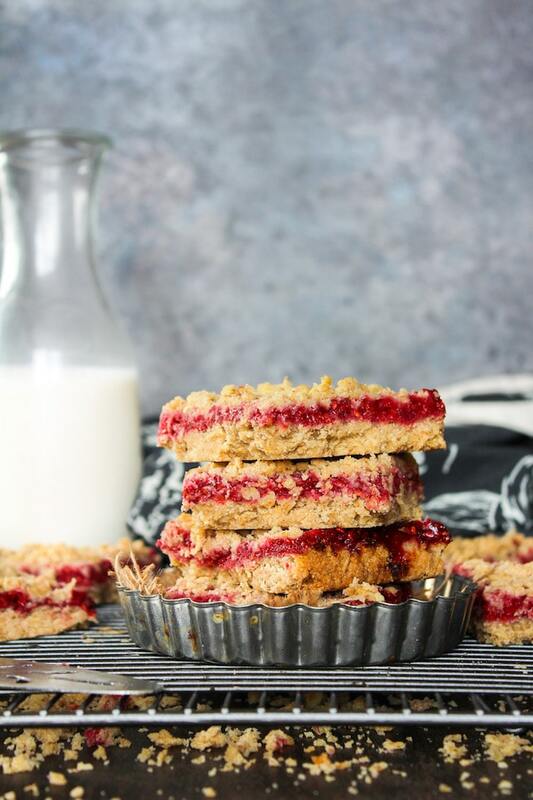 The end result makes for a super easy, crumbly oat crust with a sweet and tart raspberry filling. What more could you want? 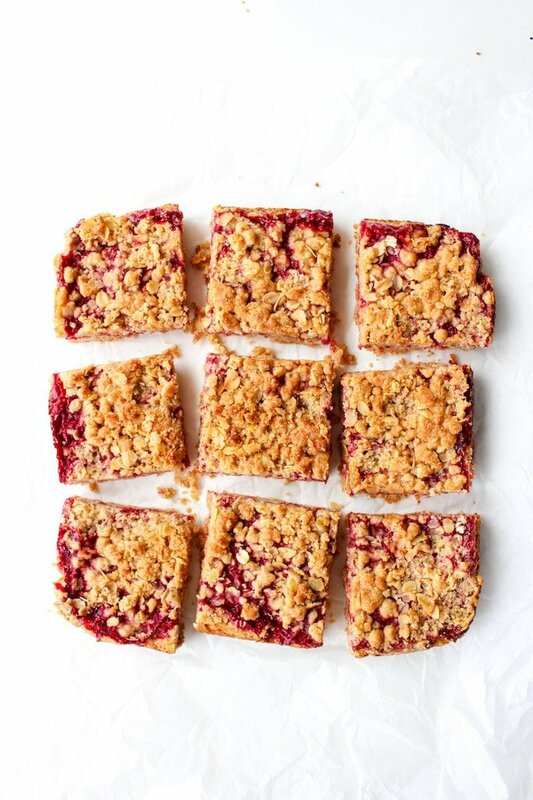 Don’t forget to #asaucykitchen on instagram if you try these raspberry crumb bars! We love to see what you make with it! You can also post your pictures to my facebook page! 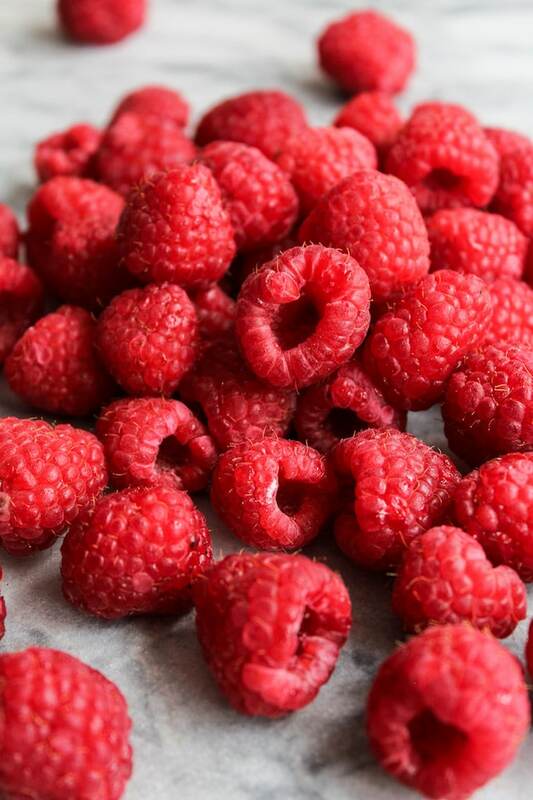 Combine the raspberries and lemon juice in a small sauce pot and set on a low heat on the stove top. Stir occasionally and let the raspberries breakdown over the heat. Stir in the sweetener and the cornstarch. After about 5-7 minutes, remove the raspberries from the heat and let cool while you working on the crumble. In a large bowl whisk together the oats, flour, sugar, salt, and cinnamon. Stir in the melted coconut oil until combined. Measure out about 3/4 of the dough and press into the bottom of a greased or lined 8x8in square pan. Spoon the raspberries mixture evenly onto of the bottom crust. Take the remaining 1/4 of the dough and sprinkle it over the top of the fruit. Place the pan bake in the oven and bake for about 40 minutes or until the top comes out golden brown. Cool for at least 10 minutes before cutting into slices and store in an airtight container for up to five days. You can substitute coconut sugar for the brown sugar and butter for the oil if you like. I’ve been wanting to make crumble bars for ages so I’m so glad I found your recipe! I made them this afternoon, absolutely delicious 🙂 I’ve shared them on Instagram and have used your hashtag – hopefully you see it! Hi Kate! So glad you liked these! These never seem to last more than a couple of days in our house, but we kept them on the counter. Hope that helps! Anyone had any luck making these with frozen raspberries? Or would that be way too squishy?